A part of the Dior Fall 2016 Skyline Makeup Collection, the Dior Addict Ultra Gloss Lipsticks are gorgeous! They retail for $43 CAD at Sephora. The packaging, texture and and wear time are beautiful! They are somewhere between a balm and lipstick. Sheer to medium pigmentation and moisturizing. As you can see, they have the gorgeous Christian Dior decal in the centre of the tube, I love that this sticks around even after you start using the product. They have no real scent, so if you are sensitive to sent these are all good for you! The shade Sophisticated surprised me the most! It has an ever so slight shimmer that makes it so interesting! Generally, shimmer and frost in lipstick is a very big no no for me but I love it. It is a limited edition shade, so if you like it, grab it! Black Tie has the most pigmentation of the bunch, it is a quintessential deep berry shade for fall. These are a comfortable but luxurious lipstick. They look great in your purse and on your lips! 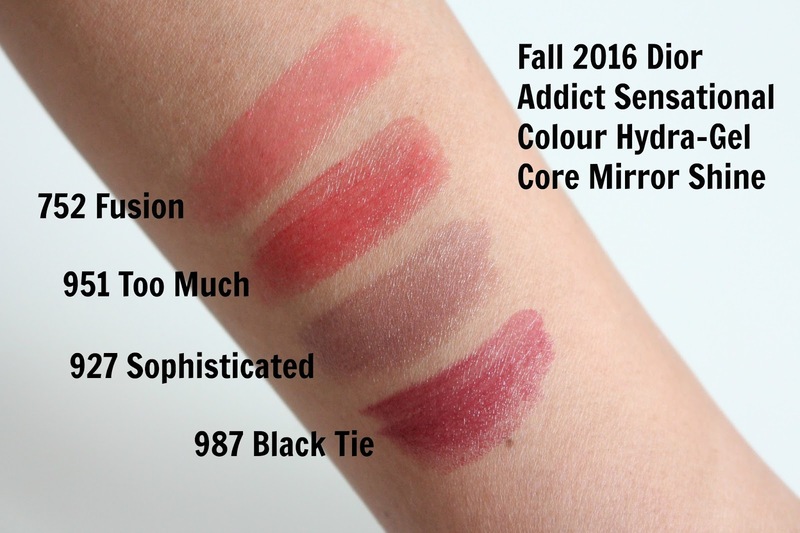 Thanks for the lip swatch of Sophisticated. Love it on you (and I'm running to get it haha)!